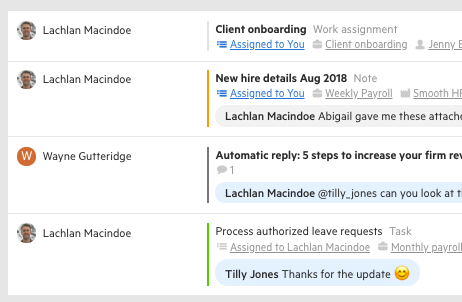 Triage contains new emails and notifications of work items assigned to you, notes from colleagues, and client task activity. To start you off, your 20 most recent emails in your inbox will be synchronized with Karbon. Your emails and notifications display various information that allows you to scan Triage faster. These different items each have their own color bar in its left margin. To help you sort through Triage quickly, the filter option lets you choose to see all these items, only emails, or only notifications. Reply to an email as you would in your email inbox. Once actioning it, don’t leave it in Triage—clear it. The email will still be available on the contact’s timeline if you’ve added the sender as a contact. We liken email folders timelines in Karbon, if you'd like to store an email to a person timeline or an organization timeline, simply click on the options menu "..." and select to add to contact. Assign an email to yourself or a colleague if you want them to take ownership and action it. Once again, when you've assigned the email, clear it. The assigned email will show up on your colleague's to-do list where you can track its status. Add an email to piece of work if the email is part of a job you’re working on (i.e. monthly bookkeeping, sales tax, etc. ), so your team can see all relevant communication tied to it. Clearing an email from Triage will not delete it from your email account, but archive it. You have two more options to help eliminate the clutter from your Triage. Any emails that do not relate to your work—such as newsletters or event invitations—but still need addressing or reading later, you should consider marking as low priority. Click the 3 dots of your email and select low priority. Doing this will mean that email, and all future emails from that sender, will automatically be delivered to your low priority section for you to read later. You can also choose for certain emails to skip Triage by creating rules and folders in your email client. When you’ve done this, reach out in Help & Feedback to let us know what those folders are. We'll ensure any emails tagged there won't appear in Karbon.